Jeppe has a cricket run machine coming through the junior ranks. 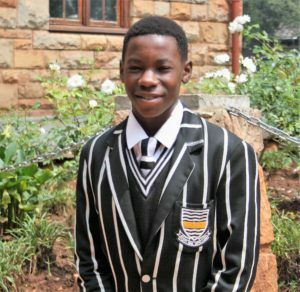 He is Tshepo Stafa, in the under-15A team and he got his second century in a row when he made 120 against St David’s on Saturday. He was 102 not out in a T20 game against Dainfern last Wednesday, after scoring two 50s in a row before that. His run of good form stretches back to last year when he notched up seven half centuries and two 100s over the two halves of the season. His cricket origins are in Soweto where he was spotted by the Gauteng Cricket development people. “I played for the Gauteng under-13 team in grades six and seven, and they arranged for me to move to Jeppe Prep in my last year of primary school,” he explained. Now he is part of the very successful Jeppe under-15 team and he is enjoying it. “We have good team spirit and our coach, Mr Casey, knows the game and gives us encouragement,” he said. Tshepo is a boarder at Tsessebe House and he thinks it has been good for him. “We get encouragement in everything we do and there is no room for slacking off,” he said. There will, no doubt, be more runs from him before that.